Home and garden interests, along with enthusiasm for the natural biological control work wasps provide on a global basis explains much of the wasp’s popularity. Generally the larger wasps common seen in residential areas fit into two categories: Vespid wasps (family Vespidae) and Thread-Waisted wasps. 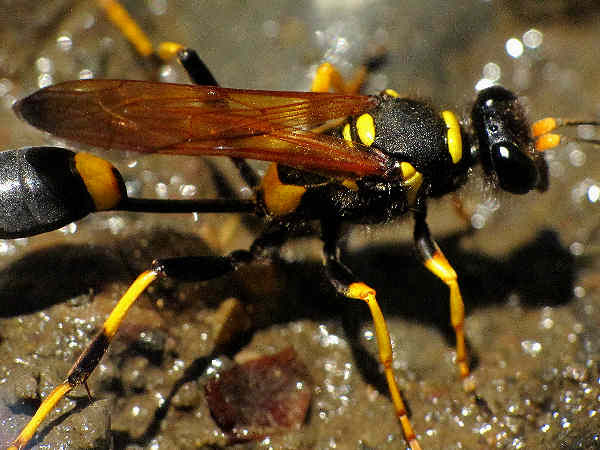 Vespid wasps pose the greatest concern to humans because of their habit of building nests in residential areas and their tendency to sting (multiple times) as a defensive mechanism, when their nests are threatened. They can build nests on structures around the house or like the Yellowjackets in the video, they can build nests in the ground. Most homeowner tend to associate members of the subfamily Polistinae, paper wasps, with vespid wasps. Three genera represent the subfamily, but for all intent and purposes, paper wasps and the Polistes genus usually represent the group. Their appetite for caterpillars and other garden pests often translates into their being welcome guests in many back yards, with some limits. Paper wasps, stinging insects that defend their nests, explains homeowner concerns about their presence around the doorways. At the same time, their appetite for caterpillars and other garden pests often translates into their being welcome guests in many back yards. The standard Polistes story posits them as semi-eusocial insects, whose nests are built on a annual basis and tended by a queen and workers. Approximately twenty native poliste species, most regionally based, inhabit residential areas, fields and forest across North America. A quick yard check during the warmer moths of the year provides a good opportunity for identifying local poliste species. Preventative measures for dealing with paper wasp nest problems around the house can be as easy as removing the nest from the porch roof as soon as it is spotted. Most people recognize yellow jackets (Paravespula) as the uninvited guests at many picnics. They are all social wasps that build, and vigorously defend, ground nests. As the colony grows over the course of a summer, the need for food expands. The presence of a sweet tooth partially explains their scavenging ways at picnics and barbecues. Many homeowners opt to remove them when they nest around the home because their sting is painful. Often yellowjackets can be confused with European paper wasps because their bodies have very similar black and yellow color patterns. The second picture shows a European paper wasp with a white line pointing to a yellow spot on the thorax. 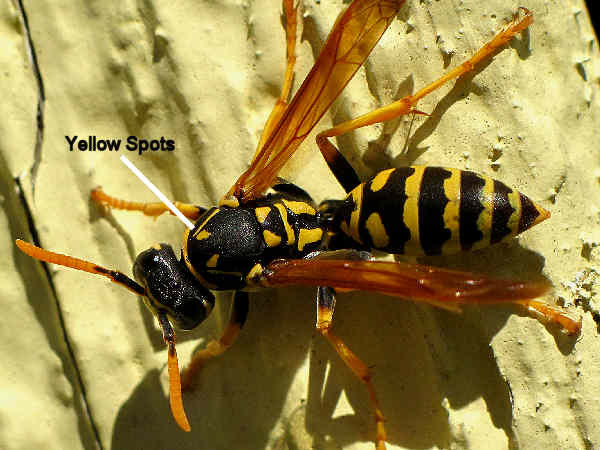 The presence of the yellow spots, which are absent in the yellowjacket picture is a good identification clue. 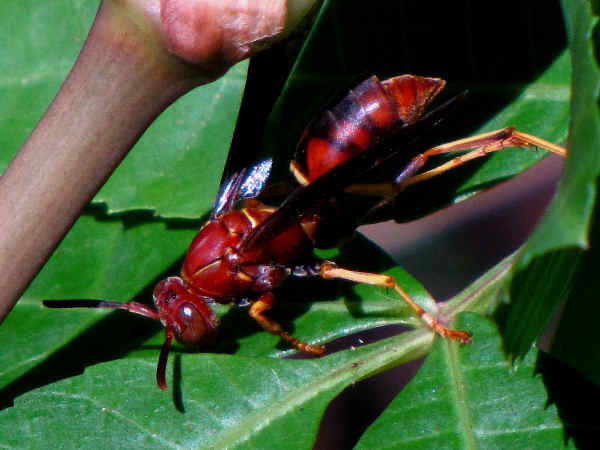 Knowing the difference between yellowjackets and paper wasps around the yard is important because they each build different types of wasp nests. Identifying the proper wasp makes looking for the nest easier. Potter and Mason Wasps (Eumeninae), the most diverse of the five vespid subfamilies, receive their name based on their pot shaped mud nests. 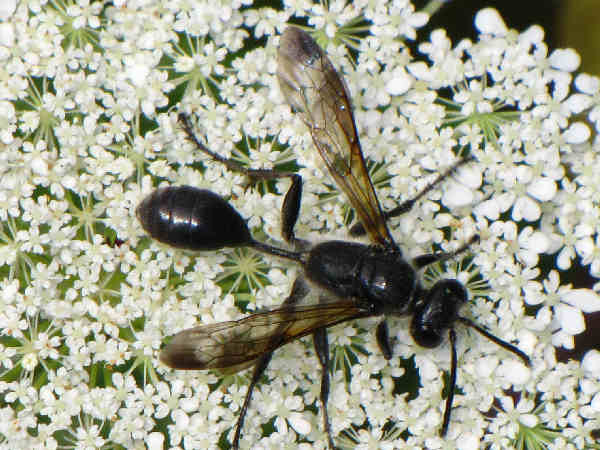 The approximately twenty in North America species get described as solitary, predator wasps and beneficial insects because of their use of caterpillars and other insect larvae as their principle larvae hosts. Potter wasp appearance varies slightly from genera to genera. Pachodynerus erynnis in the picture is a small, colorful potter wasp species with a range limited mostly to the South East and Gulf Coast states. They have a habit of nest building in wood structures such as benches, fences and sides of houses. Baldfaced hornets, named for their white face, are large paper nest making insects. 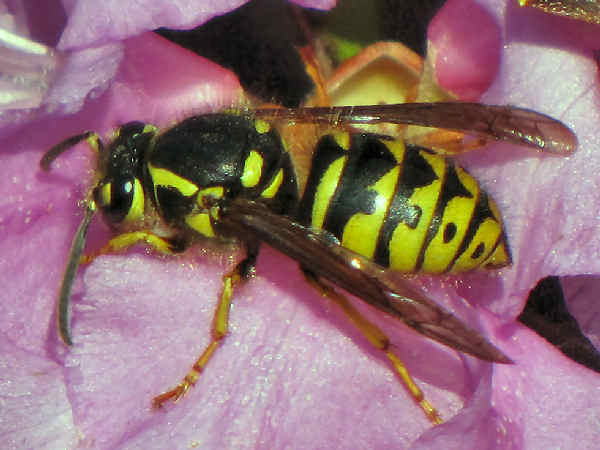 Despite the name, they are more closely related to yellow jackets than to hornets. Most people become familiar with them when they build a large oval paper nest on a tree in their yard. They are social insects, with the annually constructed nests consisting of a queen, workers and drones. While they are not characterized as aggressive bees, they do sting when defending their nest. Nests located in close proximity to high traffic locations around the house and yard often need to be removed. Approximately one hundred and twenty five thread-waisted wasps (Sphecidae) call North America home. Familiar to most people as the long, thin wasps that occupy flower tops during the warmer seasons, their sometimes fragile look masks their predatory nature. 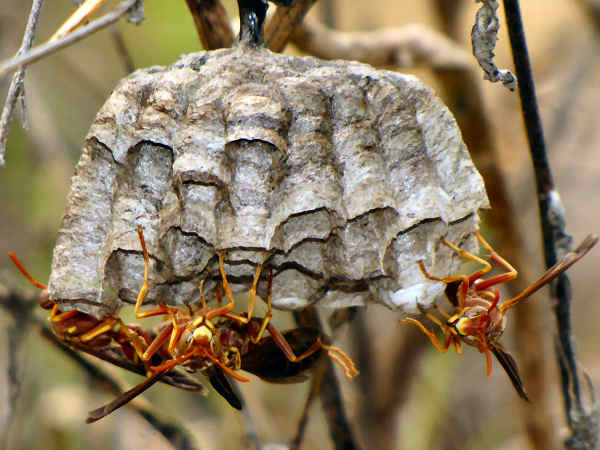 Thread-waisted wasps capture and paralyze a variety of insect species and then transport them to their nests as hosts and feed their own larvae. 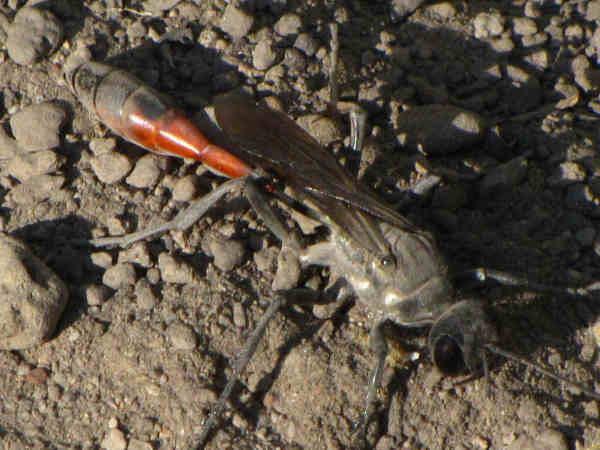 Five Amophilia wasps, collectively referred to as sand wasps, build nests in sandy soils across North America. The picture highlights the long, skinny body with a very pronounced thin waist. Most species have variations of red and black color markings on the thorax and abdomen. Ammophila do not live in their nests and therefore they do not generally cause any problems for homeowners. Three common Sphecidae, the Black and Yellow Mud Dauber, (Sceliphron caementarium), the Blue Mud Dauber (Chalybion californicum) and the Pipe organ mud dauber (Trypoxylon politum) build mud nests on a variety of substrates, predominantly wood. Nests built around residential areas can be considered nuisances. 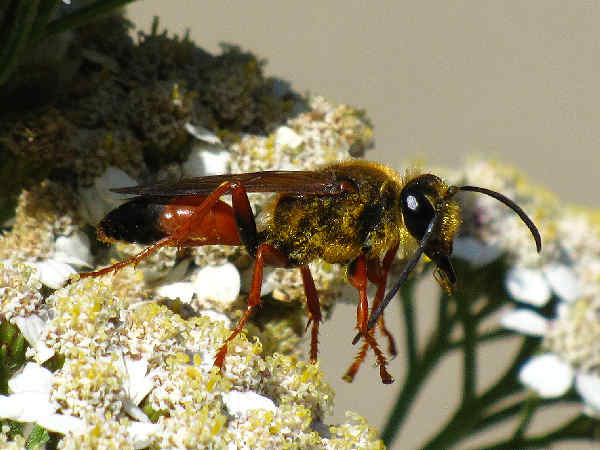 Because they are solitary wasps, their sometimes aggressive nature gets saved for prey rather than humans. Grass-carrying wasps of the genus Isodontia build cocoons shaped nests of grass for their young. The association of grass with many residential areas of the United States means the species can be common around homes. 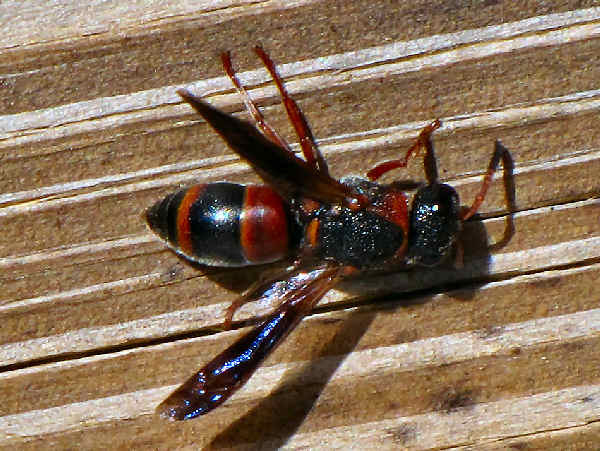 As with most solitary wasp species, they are not known to be aggressive around humans. They nectar on flowers. About one dozen colorful Sphex species, or digger wasps inhabit North American soils. With the exception of the Great Golden Digger Wasp’s (Sphex ichneumoneus) continental range, all other Sphex species limit their range to specific geographical areas. They sting, but they are not aggressive.